US President Donald Trump said on Thursday his summit with North Korean leader Kim Jong Un had failed to reach agreement due to North Korean demands to lift punishing US-led sanctions. "Basically, they wanted the sanctions lifted in their entirety, but we couldn't do that ... we had to walk away from it," Trump told reporters after summit talks were cut short. Both leaders left the venue of their talks, the French-colonial-era Metropole hotel, without attending a planned lunch together, and returned to their hotels. Failure to reach an agreement marks a setback for Trump, a self-styled dealmaker under pressure at home over his ties to Russia and testimony from Michael Cohen, his former personal lawyer, accusing him of breaking the law while in office. Trump said Cohen "lied a lot" during Congressional testimony in Washington on Wednesday. While Trump had said he was in "no rush" to strike a deal with North Korea, and wanted to do the right deal with Kim, the White House had been confident enough to schedule a now cancelled "joint agreement signing ceremony" at the conclusion of talks. "You always have to be prepared to walk," Trump said, describing the two days of talks as very productive. "We had papers ready to be signed, it just wasn't appropriate." Kicking off their second day in Hanoi earlier on Thursday, Trump again stressed the talks aimed at tackling North Korea's nuclear threat should not be rushed. He said he would be happy as long as North Korea conducted no more nuclear or intercontinental ballistic missile tests. Trump said Kim had promised him there would be no more nuclear or rocket tests. Kim did not elaborate on what "denuclearisation" would entail, but asked if he was ready to take concrete steps, Kim said they had just been talking about that. The two leaders' first summit, in Singapore in June, the first between a sitting U.S. president and a North Korean leader, produced a vague statement in which Kim pledged to work toward denuclearisation of the Korean peninsula. "It's too early to tell, but I wouldn't say I'm pessimistic. For what I feel right now, I do have a feeling that good results will come out," he said, in what was believed to be his first ever response to a foreign journalist. "There must be people who watch us having a wonderful time, like a scene from a fantasy movie. We have so far made lots of efforts, and it's time to show them," Kim said. Trump reiterated North Korea's potential, if a deal can be done, saying the isolated country could be an "economic powerhouse". 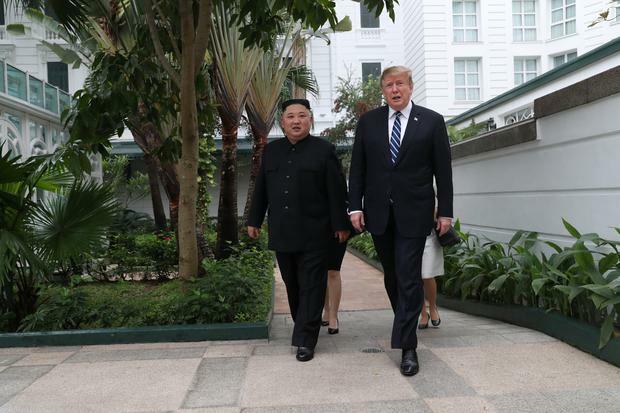 Trump said late last year he and Kim "fell in love", but there have been doubts about whether the bonhomie could move them beyond summit pageantry to substantive progress on eliminating a North Korean nuclear arsenal that threatens the United States. 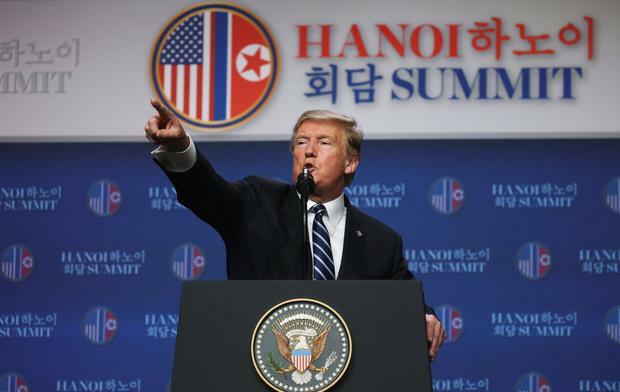 While Trump indicated a more flexible stance in the run-up to Hanoi, critics warned that he risked squandering vital leverage over North Korea if he gave away too much, too quickly.